Chances increase for a White Christmas? (update…This now looks like happening later ….! )The chances remain slim but some forecasts are suggesting a pretty dramatic cooling around Christmas – possibly enough for snow, certainly for some hilly parts of the North UK, but not for Reigate! The chart shows a forecast for Christmas Day: note the cooler NW wind direction as the LOW pressure moves to the North of the UK. 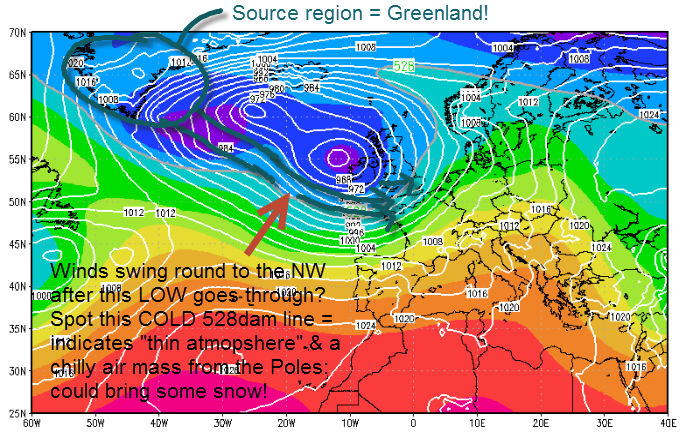 This chart also shows a “thinner” and colder atmosphere (indicated by the 528dam line). The temperature chart predicts a similar fall in temperature for Surrey around the 23 December. Nevertheless, most models are still predicting a green Christmas with cool, wet conditions driven in from the Atlantic.